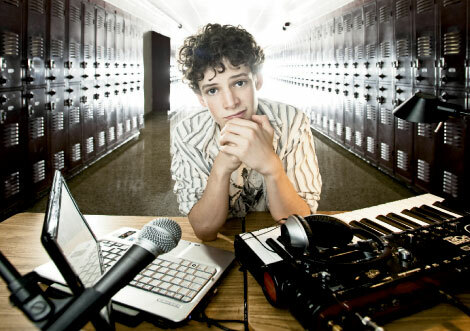 At an age when most children were playing in the sandbox, Jaffe was learning to create electronic music. He began experimenting with computer-generated sounds at the age of six, and built a theremin a couple of years later. The precocious eighth-grader uses his theremin and a computer rig (complete with twin monitors, musical keyboards, MIDI-controller, and several amps) to create funky dance beats, which he performs at venues across the region. Jaffe joined Asheville’s thriving electronic music scene when he was eight years old, playing shows with his theremin teacher, Dave Hamilton, as The Electromagnetic Duo. After building contacts with Hamilton’s contemporaries, Jaffe started performing solo as a DJ and built a name for himself, appearing at area festivals including the Lake Eden Arts Festival in Black Mountain. He performs solo gigs at Asheville-area venues like The Orange Peel under the stage name Numatik.